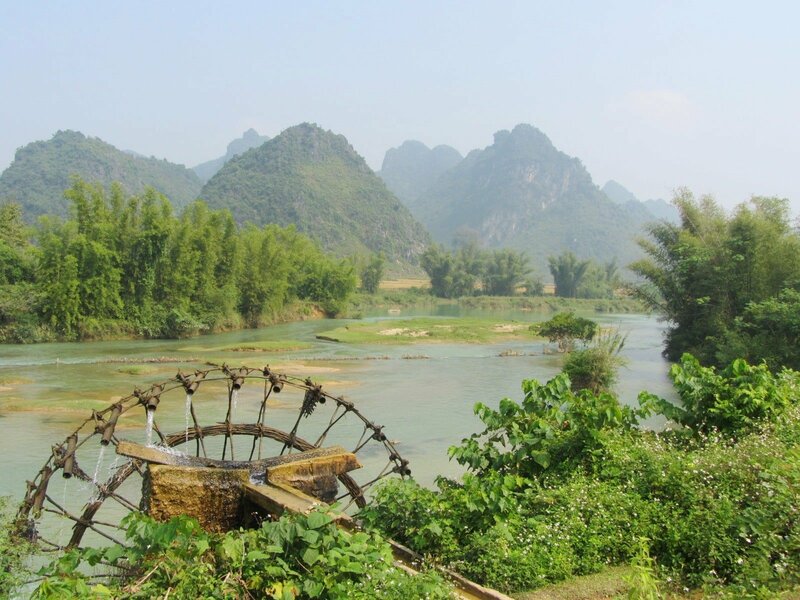 Guest blog courtesy of the Vietnam Coracle. A bucolic corner of Vietnam, the northeast is a garden of rice fields, forests, lakes, and clear rivers ambling through limestone corridors. A mixture of meandering back-roads and freshly-sealed highways lead through three provinces: Cao Bang, Lang Son and Bac Kan; all of which are among the most sparsely populated in the country. Vietnam’s ethnic minorities are actually in the majority here, and their fascinating cultures and ways of life dominate the area. The scenery is pastoral and peaceful, but limestone karsts are a constant and dramatic presence on this loop. China looms large to the north; at times literally a stone’s throw away. A rich history – from victorious revolutionary exploits to devastating invasions and economic recovery – adds spice to this scenic ride. 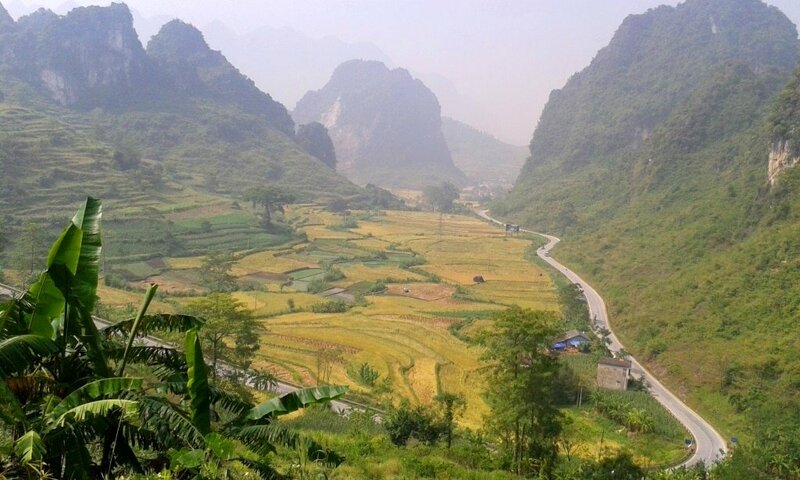 The Northeast Loop is a favourite of mine, and it links seamlessly with the Ha Giang Extreme North Loop, to the west. Below is my full guide, map and video of the loop. Each section represents one province: they do not necessarily correspond to one day on the road. The total distance is850km. To get the most out of this road trip, I recommend spending 2 days on each section. I’ve included places to stay and eat throughout this motorbike guide, so no matter where you end up, you’ll be able to find food and a bed for the night. This is a meandering course around the northeast: it is not intended as the most direct route between each point; rather it is the most scenic and rewarding one. I’ve written this guide going clockwise on the loop, but you can ride it in either direction. As with other parts of northern Vietnam, the northeast experiences a real winter. From November to March temperatures can be chilly and conditions misty. The best time of year is September and October, when the sun is warm, harvest colours illuminate the countryside, and rainfall is rare. Note: the northeast is famous for its constantly changing road conditions: check the comments section at the bottom of this page to see any updates from readers. 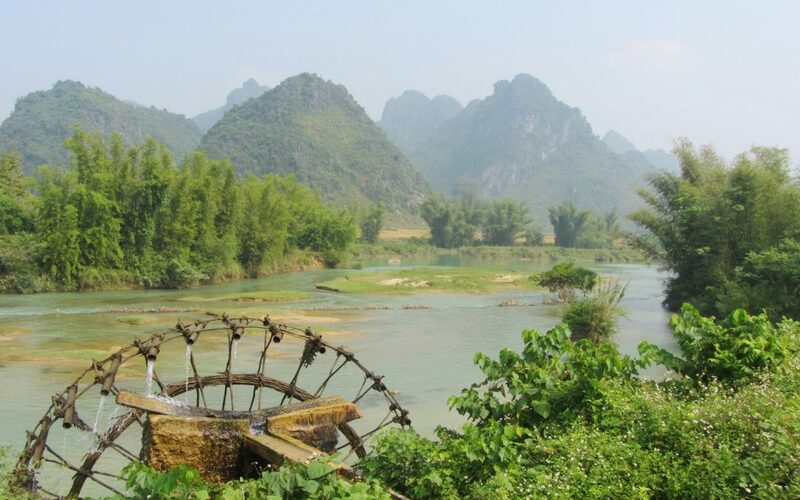 The journey begins in Cao Bang City, a likeable little place on a promontory formed by the merging of the Bang Giang River and a tributary. 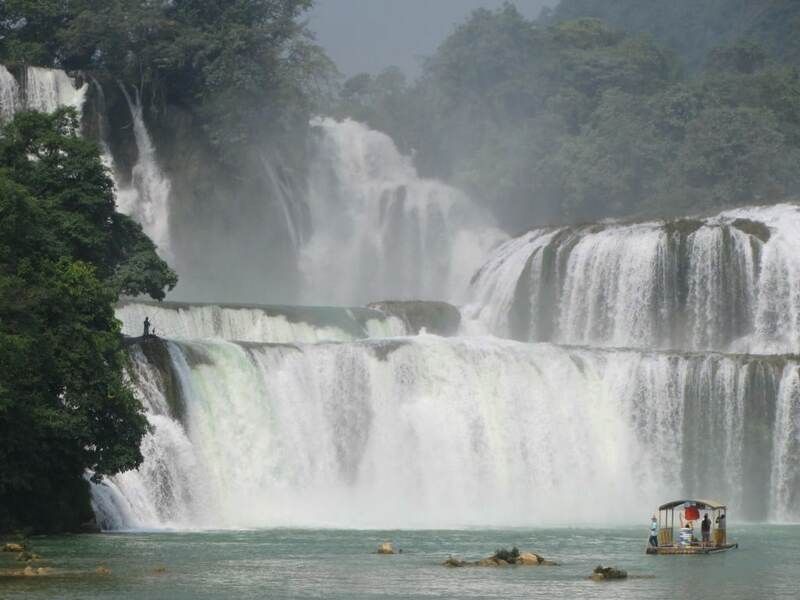 Cao Bang has more than enough good food, accommodation, and small Vietnamese city charm to keep you entertained for a day or two. The romantically namedPhố Vườn Cam (Orange Orchard Street) is a continuation Kim Đồng Street and Highway QL 4A as it passes through town. This is where you’ll find a string of decent-value mini-hotels and nhà nghỉ(guesthouses), as well as plenty of good street food. (For more about nhà nghỉ read this). Hoàng Anh Hotel (131 Kim Đồng; 0263 858 969) offers clean, bright rooms for $10-$20 (200-500,000VNĐ) a night. 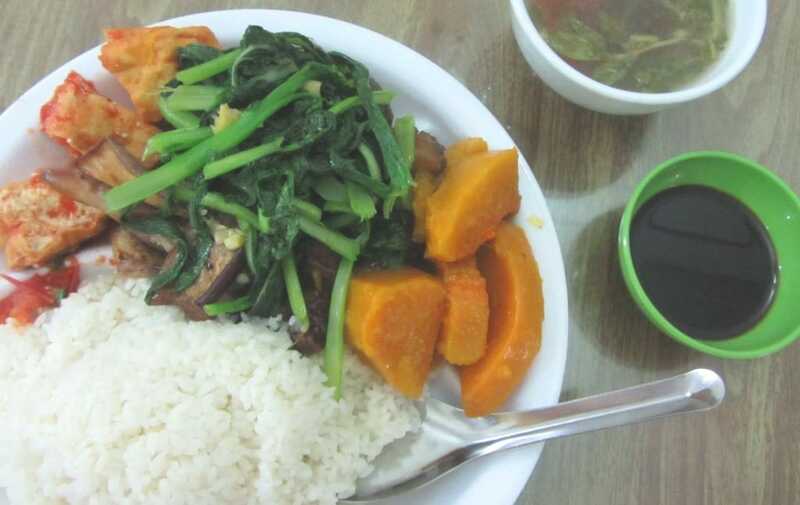 Local food is interesting and appetizing in Cao Bang. A speciality of the region is lạp sườn which is a smoked pork sausage originating from China. There’s a cluster of lạp sườn producers on Vườn Cam Street, just beyond the night market, with strings of sausages displayed on the sidewalk. For breakfast, try the phở at the classic ‘no-name’ soup house between 2 and 6 Hồng Việt Street, behind the market. If you’re feeling cold, do as the locals do and order rượu nếp hấp trứng which is an egg and rice pudding soaked in rice wine. Eaten after breakfast, locals say it keeps your body warm on cold days. 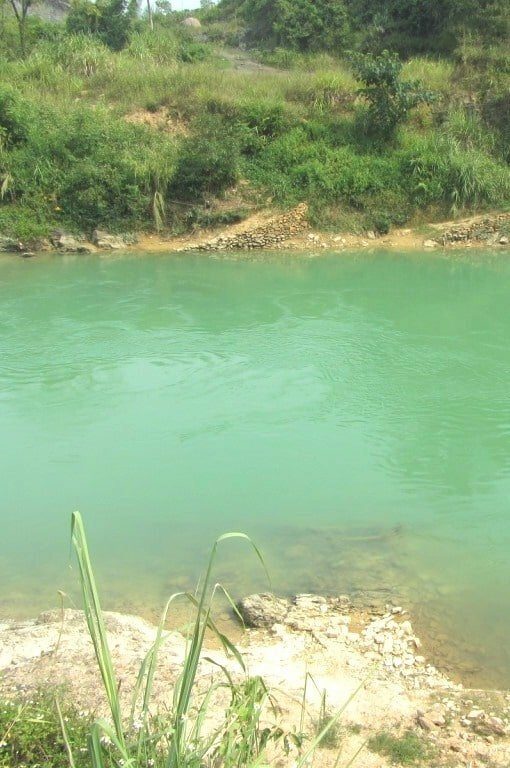 Head east over the Bang Giang River and leave Cao Bang on road TL203, going northwest. 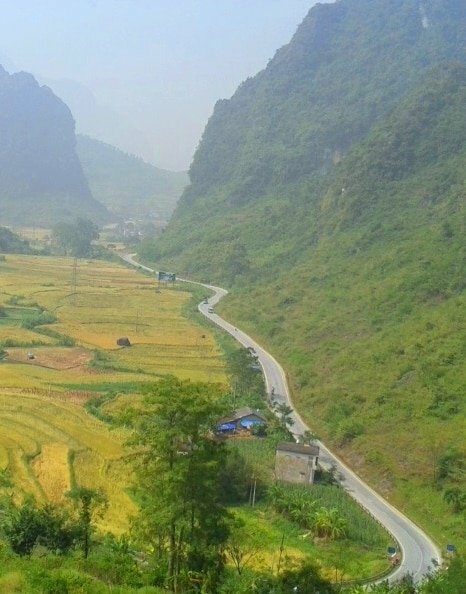 The lush countryside envelops the road as soon as you exit Cao Bang City. Bamboo grows up over the road, forming a shaded archway of dappled sunlight. Old, stone farm houses stand in fields of shimmering rice, bisected by gentle streams. Limestone karsts rise up from the carpet of green, like giant arrowheads. 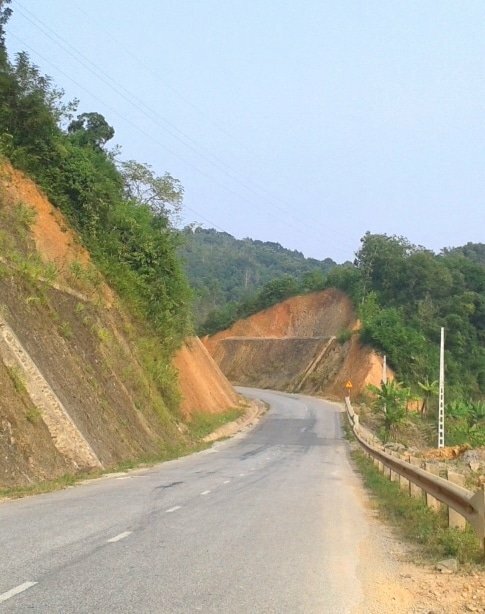 This is the northern-most stretch of the Ho Chi Minh Road, which runs the entire length of Vietnam. This particular section is a sacred way for many Vietnamese, because it leads to a remote border with China, where Ho Chi Minh crossed back into his native Vietnam in 1941, after 30 years of absence. Ho lived in a cave on the border and began the movement that would eventually lead to the declaration of independence from French colonial rule, in Hanoi on 2nd September, 1945. Even if you have no interest in Vietnamese revolutionary history, Pac Bo Cave is a mesmerizingly beautiful area to visit. The cave is located at the very end of the Ho Chi Minh Road, 8km beyond the crossroads just north of Xuan Hoa (also known as Ha Quang). There’s a local guesthouse near the car park: Nhà Nghỉ Hai Hoa: 0983 983 623. (Read my guide to Pac Bo Cave here). After the cave head back down to the crossroads just north of Xuan Hoa. Turn left (due east) on road TL210, signposted to Tra Linh (also known as Hung Quoc). Climbing sharply up limestone cliffs, this fantastic back-road shadows the Chinese border. A huge white gash in the landscape, the road twists through a karst forest, passing remote villages that appear to be stuck in time. Homes are made of packed mud and straw with baked tile roofs. Oxen, buffalo, and horses transport crops, farming equipment, and people from field to village. Stone walls divide fields of rice, corn, and soy beans. Hay is stacked by children in 20-foot high pylons, echoing the shape of the limestone hills. Dozens of small villages dot this road, each one teeming with kids, flowing out of school gates on bicycles for the long ride home. A rocky creek ekes through the valley, providing animals and farmers with a bath after a hard day’s work in the fields. Eventually, this wonderful roads ends at the dusty, crossroads town of Tra Linh. A short hop from a remote Chinese border gate, Tra Linh sells Chinese beer and candy in its shops, and large trucks, loaded with a hidden cargo, await the cover of darkness to head over the border. 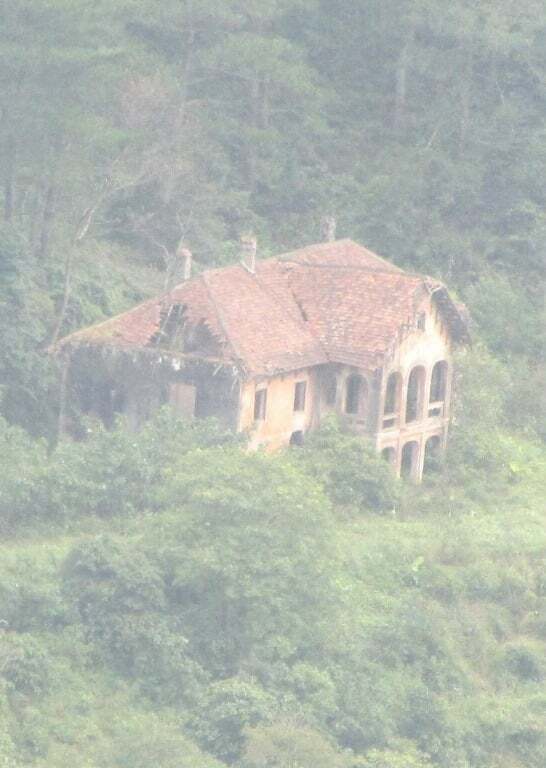 There’s a guesthouse here, but it’s clinging to life. Nhà Nghỉ Quang Dũng (01669 872 234) is a narrow, four-storey building near Tra Linh’s main crossroads. Blighted by cobwebs and bad plumbing, this is a rather sad place, but it’s kept alive by the hard working son of the owner. Rooms are around $10 (200,000VNĐ) a night. Tra Linh has an intriguing market which displays a number of goods from across the border. In the mornings it’s a great place for some Chinese-influenced noodle soups. Head south from Tra Linh on road TL205. 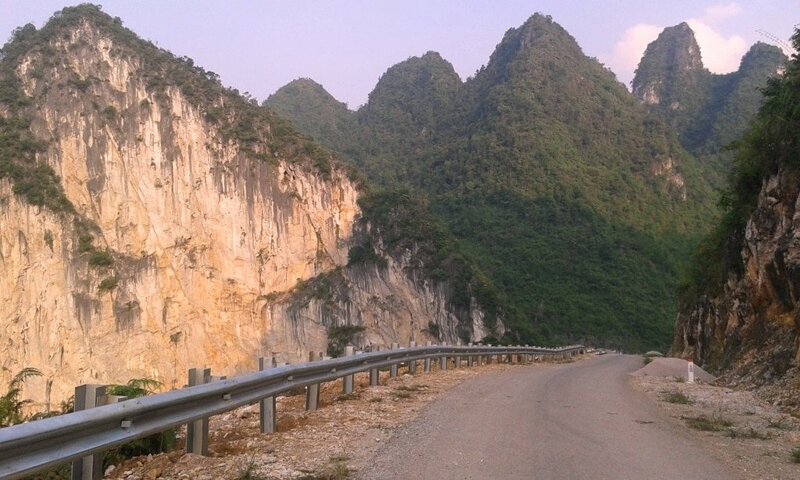 After 12km this meets National Highway QL3 at the top of the Ma Phuc Pass. Bear left (due east) towards Quang Uyen. However, before you do so, it’s worth driving five minutes in the opposite direction, down the Ma Phuc Pass, to see the tremendous views. The tarmac snakes into the distance, between limestone crags. National Highway QL3 follows yet another beautiful valley punctuated by limestone karsts. 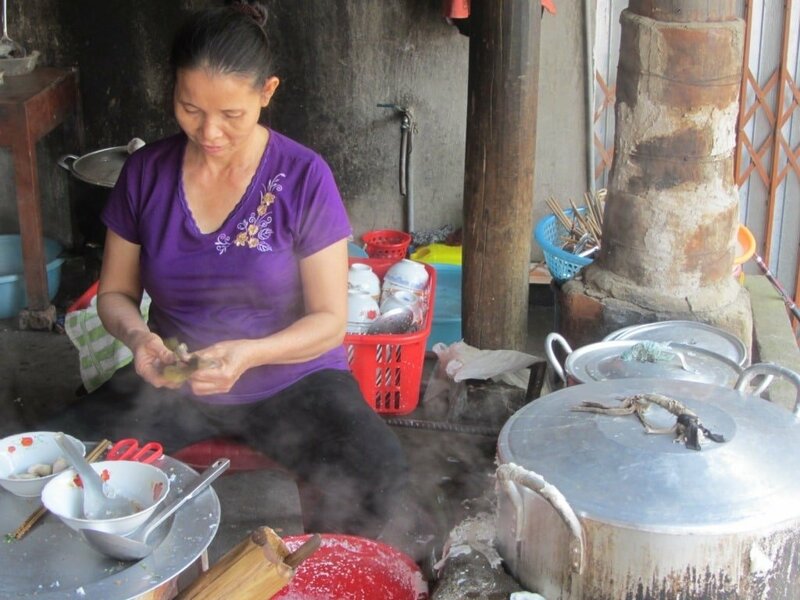 There’s a new homestay initiative on the right side of the road, about halfway to Quang Uyen. Bản Pác Rằng is a cluster of ethnic minority wooden stilt houses that offer basic accommodation and food. It’s still in the early stages so, for anyone who wants to experience a more rustic homestay than the popular area aroundMai Chau, this is a decent option. Unsurprisingly, rice in the main crop here. During late summer and early autumn the fields and villages are abuzz with harvest activity: a wonderful sight for a visitor; a lot of hard work for the farmers. Turn left off Highway QL3 and pass through Quang Uyen on road TL206. A magnificent route through the kind of scenery that makes you wish you were a romantic poet, this is a ride to savour. Drive slowly and bask in the warmth of this landscape: gurgling streams, bamboo groves, crumbling farm houses, and jungle-clad limestone hills. However, strange as it may seem, trade with China along this peaceful route is roaring. The road has been upgraded to accommodate articulated trucks, carrying containers to and from remote border crossings. Travelling in convoys, they plough through this rural idyll, leaving clouds of dust behind them. 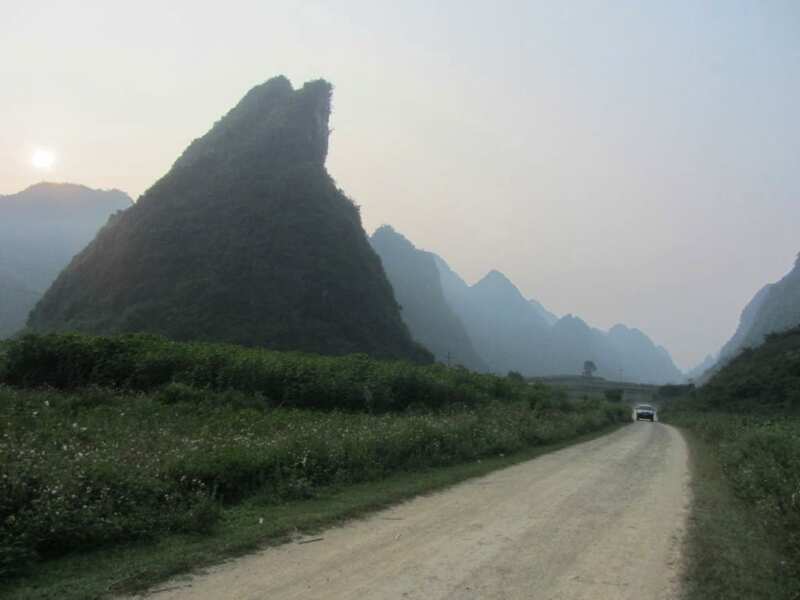 Indeed, many of Cao Bang Province’s small roads are plagued by these giants of the road. It’s a bizarre and somewhat unsettling sight to see six juggernauts screeching through hairpin bends and growling up steep passes in such a sparsely populated and scenic area. Trung Khanh is another dusty, crossroads town near a Chinese border gate. Like Tra Linh, there’s an interesting market here and a definite Wild West feel to it. Something appeals to me about these desolate, rarely visited towns, and their intriguing, dilapidated, old shophouses. There are several places to stay here, including Nhà Nghỉ Hoàn Lê, a guesthouse opposite the market on the main drag (685 Trung Khanh; 01695 705 355). Road TL206 heads east from Trung Khanh towards Ban Gioc Waterfall. I have a soft spot for this area. The jade-coloured Quay Son River flows through a gorgeous landscape that somehow gets me in my stomach; it’s the same reaction I have when listening to a piece of music I love. I once camped overlooking the river here on the night of a lunar eclipse, which I will never forget. After 25km Ban Gioc Waterfall comes into view. One of the most impressive natural sights in Vietnam, this is a place to stop for a couple of hours and explore. I’ve written a guide to the falls here. After the waterfall, road TL206 follows the Quay Son River for several kilometres. 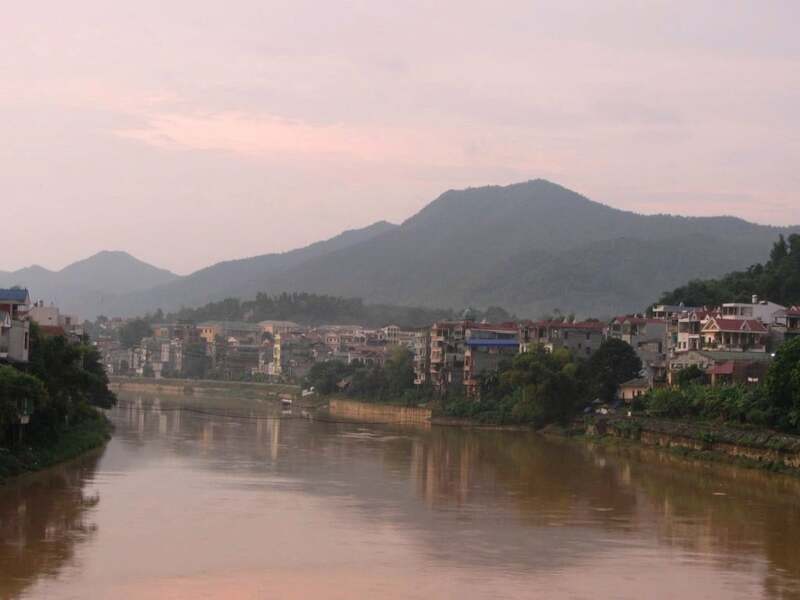 At this point, the river forms the border between Vietnam and China. Chinese characters are clearly visible on shopfronts and restaurants. At times the distance separating the two countries is only 10 metres. You can wave at Chinese people on the other side of the water, or throw a stone into the Chinese brush. Thankfully, relations between the two countries are (generally) pretty good now. This is mainly due to valuable economic trade ties. Historically, however, this border has been the main point of entry for invading Chinese armies over the last two thousand years. The most recent was the brief but bloody border war in 1979. Tens of thousands of Chinese troops poured over the border, laying waste to villages and agricultural land. Today, there are shrines by the roadside commemorating the Vietnamese who died. Eventually, the road veers away from the Quay Son River, forming a long loop all the way back to Quang Uyen. This is a corner of Vietnam that’s seldom visited, yet it’s utterly bewitching. Single track, paved lanes meander around the base of looming limestone karsts, casting their shadows over hamlets nestled among lush crop fields. At Ha Lang (also known as Thanh Nhat) Nhà Nghỉ Minh Vân (0263 830 888) is a local guesthouse that’s great for those looking to spend a night off the beaten path. Rooms are around $10 (200,000VNĐ). From Ha Lang bear right onto road TL207. Interesting new roads are being cut throughout this area, most of which eventually lead back to Quang Uyen. However, staying on TL207 is the most direct route. Quang Uyen is a good place to spend a night. Khách Sạn Duy Hương (0266 266 888) is a great comfortable hotel on Phố Hòa Trung Street, Quang Uyen’s main drag. There’s food available next door and throughout the town. Take National Highway QL3 south out of Quang Uyen. After 25km of easy, scenic, and smooth driving turn right (due west) at a T-junction for Dong Khe (also known as Thach An). Unfortunately, this short, pretty, back-road has been ripped to pieces by articulated trucks on the China-Vietnam trade route. Potholes and dust slow progress considerably. The 25km stretch can take up to an hour. However, it’s still a pretty route and the road surface was undergoing some much needed repairs on my last visit in October 2014. At Dong Khe it’s a relief to join National Highway QL4A, heading south towards Lang Son. This bold highway was constructed during French colonial times. Cutting through limestone mountains high above rocky riverbeds, it used to be poorly maintained and extremely dangerous. However, it’s recently been completely re-laid and widened; now it’s a shining blade of asphalt chiseled into the cliff-face. The 90km ride to Lang Son is smooth and easy, although it can still get clogged around the intersection for Dong Dang, the busiest border gate in Vietnam. The last few kilometres to Lang Son are on the northernmost reaches of Highway 1, Vietnam’s infamous north-south main artery. Happily, it’s in fantastic condition here, as this is the main entry and exit point for the roaring cross-border trade with China. The city of Lang Son has prospered from the increase in trade with the People’s Republic. A small, friendly city with a pleasant buzz on its streets, Lang Son is full of food, guesthouses, and a night market selling all sorts of products from across the border. Settle into a room at one of the dozens of mini-hotels on and around Trần Quốc Toản Street, sit down to a glass of cold Chinese beer, and soak up the atmosphere of this once far-flung border town. I like the friendly service and dirt cheap rooms at Nhà Nghỉ Hải Vân (10 Trần Quốc Toản; 0253 879 590). Just across the road is a quintessential local rice eatery, called Thanh Lan, where you can fill up fill with a variety of classic dishes, including chi trám, which I like to call the Vietnamese olive. After dinner, browse the night market, located a short stroll from the guesthouse. Weave your way out of Lang Son via Tam Thanh Street and onto Bến Bắc Road, heading west along the north bank of the Ky Cung River. Following the course of the river, the road snakes through a valley dotted with stumpy limestone hills, like oversized molehills covered in moss. After half an hour turn left across a bridge over the river, taking you onto Highway QL1B, towards Van Quan and Binh Gia. 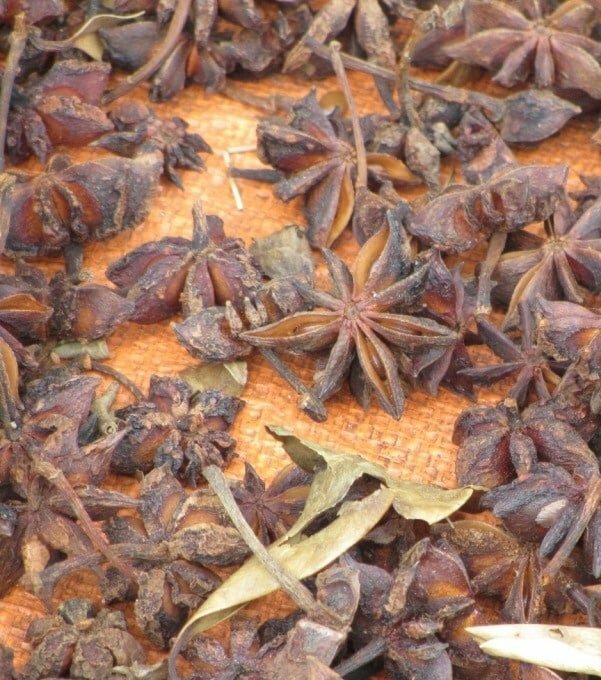 This is a lush, cultivated river valley, full of aromatic perfumes from the fields, the most potent of which is the star anise drying by the roadside. At Binh Gia turn left (due south) to stay on Highway QL1B to Bac Son. Climbing steadily, the road slices through a cluster of forested limestone karsts, affording fabulous views down into the valley, where smoke rises from the little villages of wood and tile houses. Bac Son’s reputation as a region of considerable natural beauty has been slowly growing over the last few years. Bac Son is a small, bland town with some interesting, narrow backstreets. But the town is surrounded by rice fields that are so brightly coloured it’s as if each blade of grass has been charged with an electric current. The fields are enclosed by a cradle of limestone karsts, which, no matter how many times you’ve see them, never fail to impress. Ethnic minorities populate the countryside here, living in brick, wood, thatch and tile homes that appear like nests amongst the fields and foliage. 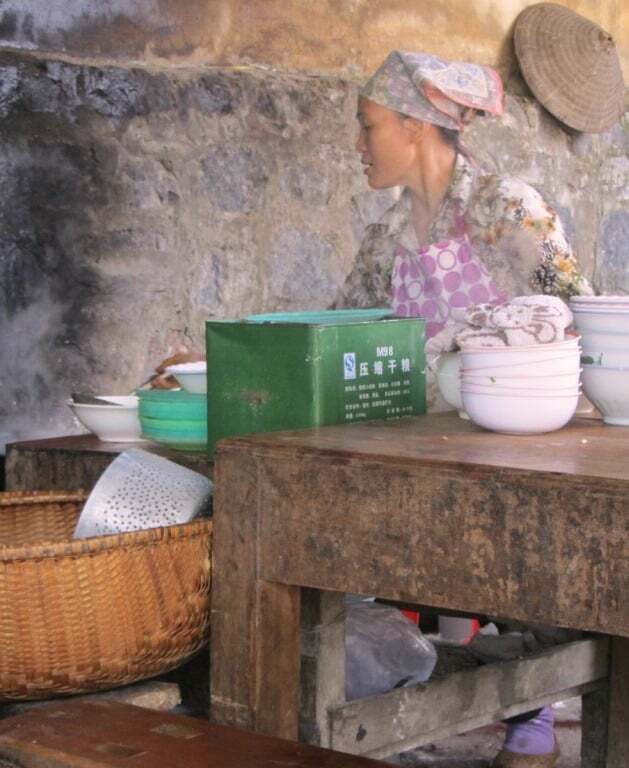 Just before entering Bac Son town, there’s a string of hive-like brick ovens where the roof tiles are baked. Locals are warm and friendly, and – to my ears, at least – very well spoken. Quỳnh Sơn homestayvillage is located 2km behind Bac Son town. It’s clearly signposted to the left at the bottom of the pass, before entering town. Expect to pay around $10 (200,000VNĐ) for a mattress on the wooden floor and two meals. However, before bedding down for the night, ride the bucolic ‘Bac Son Loop’. This 60km scenic ride takes you south from Bac Son on Highway QL1B, before turning left at Nga Haicrossroads on a gorgeous back-road that eventually leads back to the Quỳnh Sơn homestay area. The scenery is lovely: green and fresh like a salad. 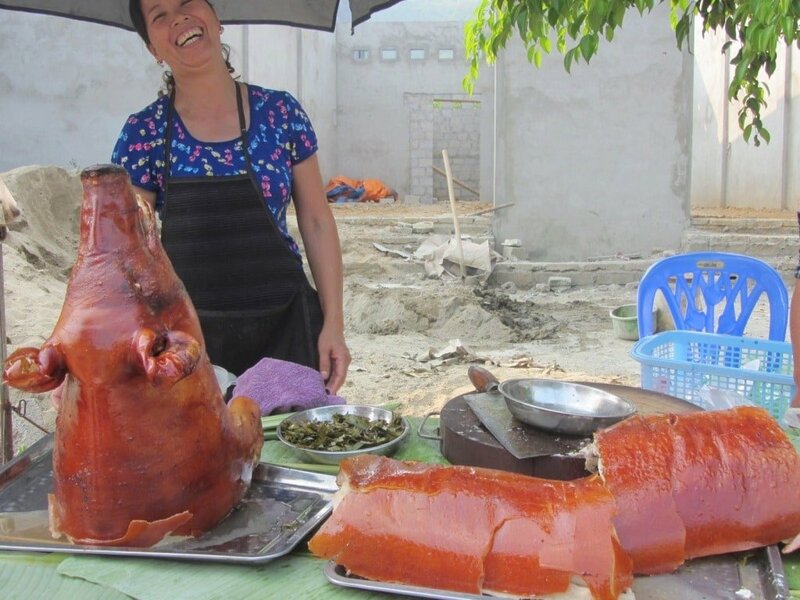 If you’re hungry try the roast pork sold by the roadside near Nga Hai: the ultimate driving snack. 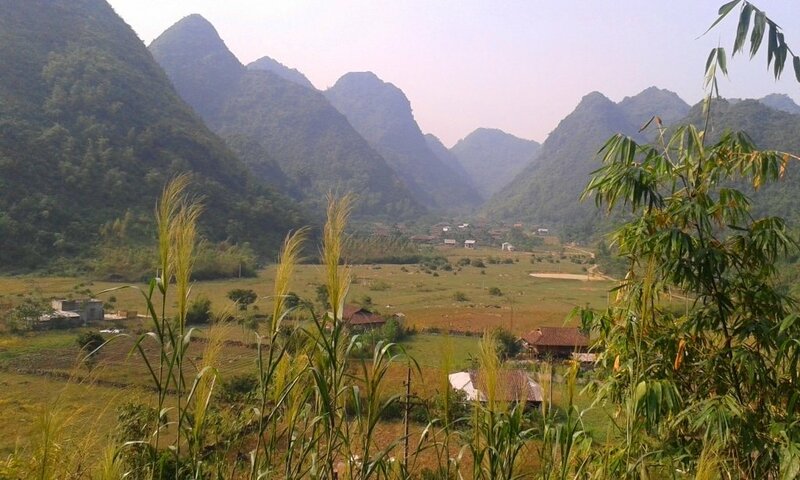 From Bac Son ride north back over the pass to Binh Gia. Bear left (northwest) on road QL279 towards Yen Lac. Although this road is officially labelled a National Highway (QL), in reality it’s a small, paved, country lane which sees very little traffic. QL279 is an extraordinary road that leads cross country, through some of the most mountainous terrain in Southeast Asia, all the way to Dien Bien Phu, in Vietnam’s northwest. 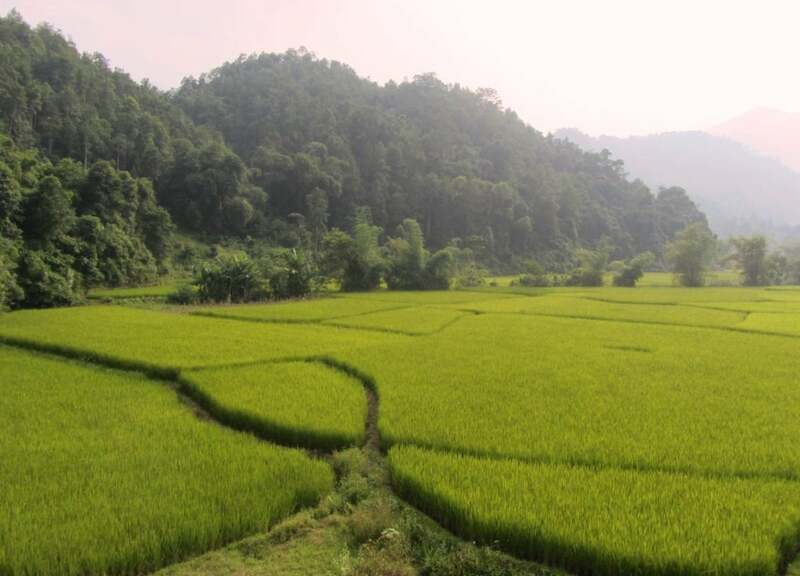 This particular section goes through Bac Kan Province, the most sparsely populated in Vietnam. It’s superb riding through warm, forested mountains and remote minority villages. The driving is easy and joyful; it’s like sitting back on a motorbike simulator and watching the landscape go by on projector screen. This is the heart of the Việt Bắc region, which was a revolutionary stronghold, particularly in the 1940s. Ho Chi Minh and his entourage could avoid detection by French authorities by taking cover in the tangle of steep valleys and forests. QL279 briefly joins QL3B just south of Yen Lac, before bearing left and continuing into the mountains. The twists and turns of this road can make you dizzy; it’s a knot of tarmac in an empty, jungled landscape. However, due to serious deterioration of the road surface, it’s necessary to turn off QL279 at Bản Giang and take a less direct (but no less scenic) route to join Highway QL3: Instead of crossing a small bridge over a river on your left, continue right (north) on a newly paved road. This road climbs up and then descends into a valley, from where it bears left (due west) and meets Highway QL3 (zoom in on my map to make sure you don’t miss the turn). Take Highway QL3 south for several kilometres to Phủ Thông. This is a very scenic stretch of road. At Phu Thong take a sharp right (due north) onto the freshly resurfaced TL258. This pretty road ends at the crossroads town of Chợ Rã, which is known as the gateway to Ba Be Lake. The town is nice enough to spend a night before heading into the national park and exploring the lakes the next day. There are plenty of hotels and food outlets at the main crossroads. Khách Sạn Hoa Sim (02813 876 278) is right opposite the market and has excellent rooms with large windows, balconies, and wooden furniture, for around $15 (300,000VNĐ). For breakfast, look out for the old woman selling bánh cuốn (steamed rice flour rolls) across the street from Hoa Sim Hotel. 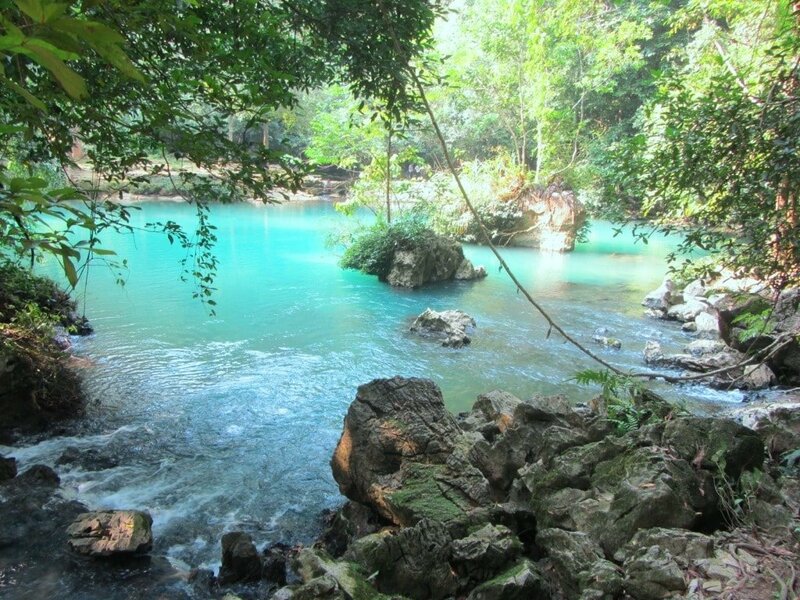 To get to the entrance of Ba Be Lake National Park, continue west on road TL258 from Chợ Rã. There are several places to stay around the park headquarters, all offering homestay-style accommodation in brick and wood houses. Pay the park entrance fee at the ticket kiosk (25,000VNĐ) and ride on through the gates, past the big but bland national park resort, and on towards the lake. The road is in great shape as it sweeps deeper into the conservation area. There’s a noticeable change in the foliage and general atmosphere: trees get taller – their trunks become knotted and gnarled – the brush gets denser and greener; everything is on a grander scale; nature has a powerful presence here. 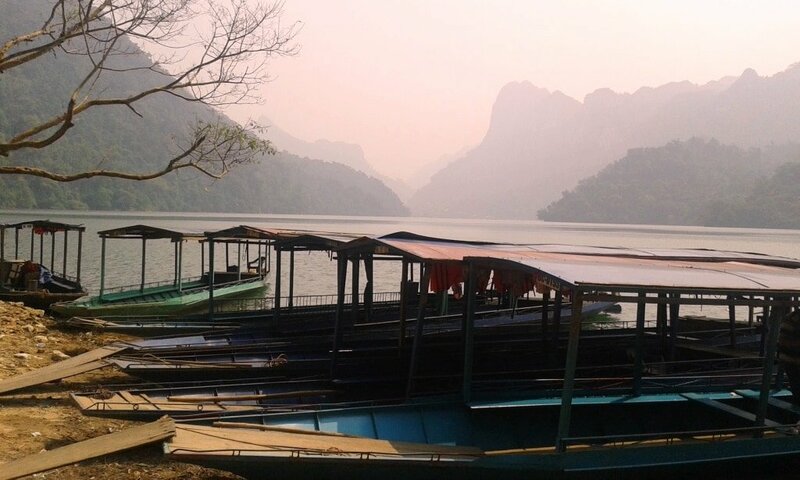 Then thelake comes into view: a placid body of water enclosed by jungled limestone mountains, the water and silence occasionally broken by narrow, wooden motorboats ferrying locals and tourists across the lake. Follow the road to the right until it ends at a cove where wooden boats gather to offer trips around the lake. This is a fantastic way to see the area, and trips are reasonably priced (200-800,000VNĐ); check the price list at the ticket kiosk when entering the national park. Alternatively, turn left just before the road starts to descend to the lake’s edge, onto a bumpy lane that leads above the lakeshore to the village of Pac Ngoi. Sprawled along the southern tip of the lake, Pac Ngoi village is crammed with decent ethnic minority homestays. However, it’s best to continue a while further to the next cluster of wooden houses at Bo Lu: it’s less crowded here and they have better views of the lake. Tourism has certainly arrived at Ba Be Lake, but it’s still in the early stages, and, although these homestays are far from rustic – wifi, satellite TV, plenty of food and drink – it’s still a fabulous experience, and homestay hosts are exceptionally warm. Newly paved back-roads lead south of Pac Ngoi and Bo Lu through wonderful, rural scenery; if you’ve got the time and want to head way off the beaten path, try getting lost on these remote routes for a couple days. 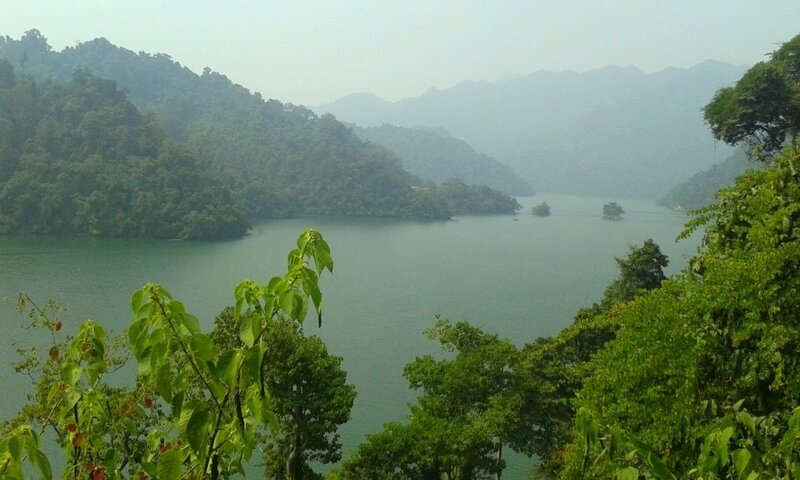 The government has big plans for Ba Be Lake National Park: perhaps, one day, this will be a Southeast Asian Lake Como; celebrities and aristocrats will have their villas perched on the forested slopes above the calm waters. But for now, it’s an easily accessible, cheap, and extremely beautiful area to visit. Excellent maps and tourist information huts are dotted along the lake road. Ride back to Chợ Rã and go out of town of road QL279, heading east. After 17km take a left (due north) onto road TL212. The first part of this spectacular road was still being upgraded when I last visited in October 2014, but it should be finished by the time you read this. This route takes you from a river valley – so lush you’ll want to hug it like a furry animal – all the way up and over one of the highest mountains in the region. Even if it’s hot and sunny in the valley, it can still be cold and windy at the top of the pass. Just before the final ascent there’s a small blue signpost on the right for ‘Tea Production and Processing Enterprise’. This small lane leads to a tea plantation with a guesthouse (0262 211 116) attached to it on a scenic plateau overlooking the valley. 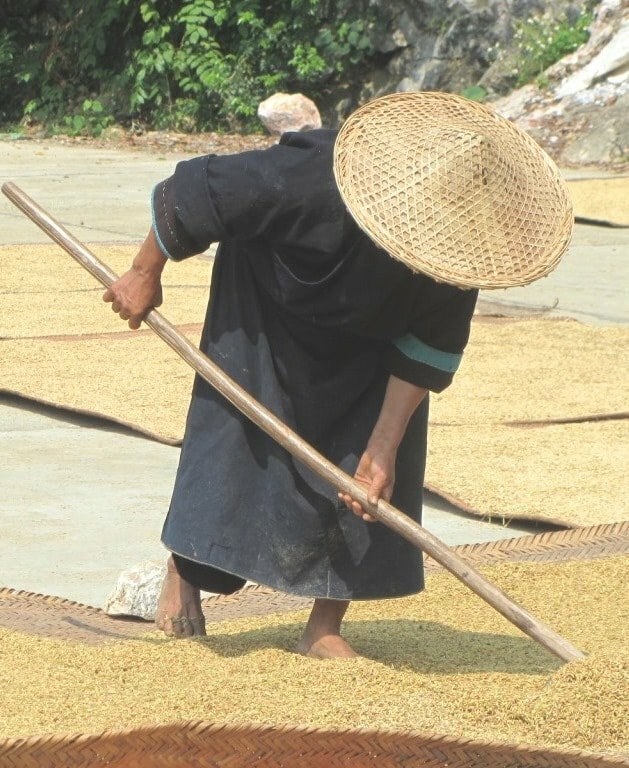 The tea is a special variety that only grows in certain conditions. Even if you’re not planning to stay at the guesthouse (nice, clean rooms for $30) you can still pop in for a brew. The tea tastes a lot like Earl Grey, which is one of my favourites. Just beyond the tea plantation there’s a dilapidated French colonial villa in the distance, crumbling on the mountainside to the west of the pass. 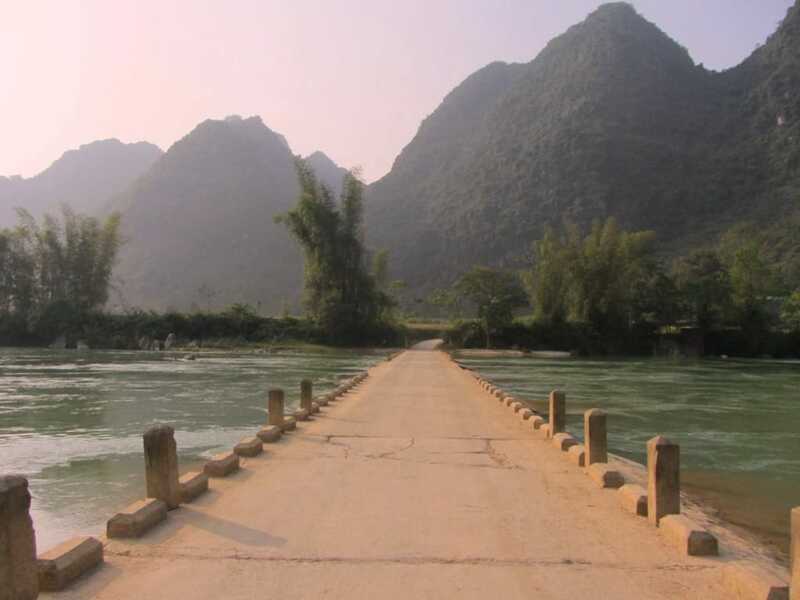 Decision time: Head east back to Cao Bang, or west to the fabled Ha Giang Extreme North Loop? Road TL212 ends at a T-junction near the mining town of Tinh Tuc. Turn right (due east) onto Highway QL34 towards Nguyen Binh. 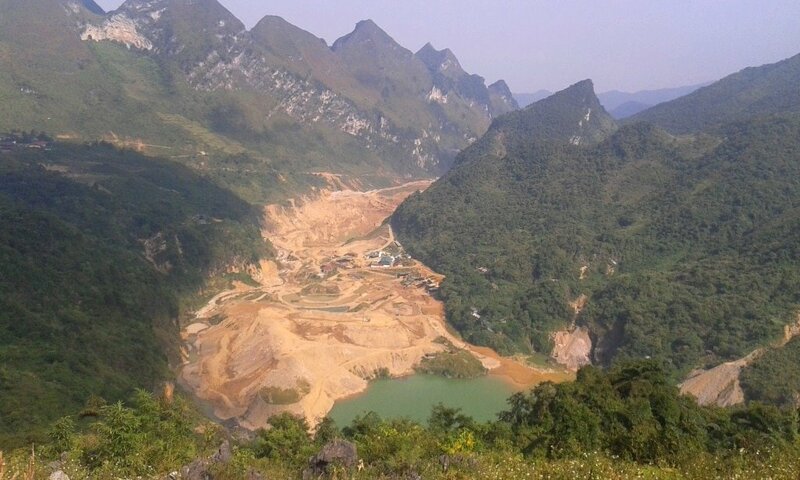 After descending a sublime mountain pass, the highway is newly paved along a pretty valley, all the way back to Cao Bang. If you’re planning to continue west to join the Ha Giang Extreme North Loop, turn left (due west) at the T-junction instead, and continue on Highway QL34 towards Tinh Tuc and Bao Lac. Originally posted on Vietnam Coracle in January 2016.